The scriptures teach us that there “must needs be . . . an opposition in all things” (2 Nephi 2:11). And what better place to learn this truth than in the Book of Mormon, with its countless examples of good and evil, righteous and wicked, heroes and villains? In this fun new card set from Val Chadwick Bagley, families will be reminded of the great examples of those who chose the right and those who chose . . . something else. This card set offers three games in one! 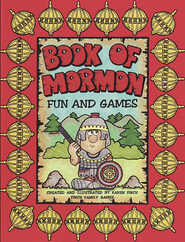 Younger children will love playing the “Book of Mormon Match Game” with these colorful characters. Or they can try their hand at “Gadianton”—“Old Maid” with a Book of Mormon twist. Older players will have fun playing “Combinations,” a fast-paced game sure to be a family favorite.